We've read it and you will, in fact, learn how to measure social media and be provided a formula illustrating exactly how to do so. Social media's great but nothing really matters in marketing unless you know how it worked. 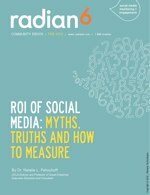 This white paper will show you how to numerically state the ROI of your social media efforts. Download it now.